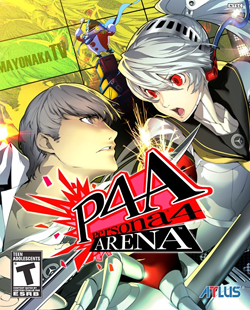 Persona 4 Arena is the result of one of the more unusual developer collaborations in recent memory; Atlus, the creators of the Persona RPG series, and Arc System Works, who are best known for their 2D fighters such as the Guilty Gear and BlazBlue series. The game takes characters from Shin Megami Tensei: Persona 4 as well as its predecessor, Persona 3, and throws them into a plot centered on a mysterious fighting tournament called the P-1 Grand Prix. How in the heck could this possibly work? As it turns out, amazingly well. Persona 4 Arena plays in a manner not too dissimilar from ASW’s efforts on the BlazBlue series. The game is heavily focused on fast-paced, offense-oriented fighting, complete with aspects such as expendable Burst moves that can knock back enemies and match-ending instant kill strikes. Also like BlazBlue, the roster is kept small with only thirteen playable characters, but P4A trades quantity for variety, with each member of the roster featuring a unique move set and play style. There is a depth and complexity to the way the game plays, but at the same time, the mechanics provide a low barrier to entry for fighting game newcomers. P4A features a healthy selection of modes and features. Most of the modes are standard fair for modern fighting games, such as an arcade mode that matches the presentation of the original arcade release, and an extra-challenging score attack mode. There is also a limited amount of DLC available for the game, including extra Navigators (characters that encourage the player and comment on the progress of the match, similar to the role played by characters such as Rise in Persona 4), as well as extra glasses options (a Persona 4 reference and a purely cosmetic extra) for each character. The standout feature, however, is the game’s story mode, which pairs Atlus’s storytelling chops with a simplified iteration of ASW’s visual novel-style narrative presentation used in the BlazBlue series. All but one of the playable characters has their own story mode path, with lengthy stretches of dialogue and text interspersed with fights. In addition to providing probably the biggest incentive for Persona fans to play the game, it’s also the most accommodating, as each fight is only one round long and the difficulty of the opposing AI is greatly reduced, making the actual act of playing through the story a breezy experience. As is the standard for fighting games, P4A can be played against opponents through either local or online multiplayer, with the online being further divided into ranked and unranked battles. From my experience, the online is smooth. Though battles aren’t entirely lag-free, what I’ve encountered hasn’t been detrimental. The game definitely counts among the best online experiences I’ve had with a fighting game. For extra flavor, players can create their own custom online titles from a library of Megami Tensei-themed words and phrases that unlock over time. Persona 4 Arena is a visual treat. Absolutely everything in the game, from the menus and UI to the way the characters look and fight stays true to the spirit of the Persona RPGs. The 2D sprites of the fighters and the environments are filled with attention to detail, as are the still portraits and backgrounds found in the story mode. It looks exactly as a Persona-themed fighting game should. On the audio side, the game is just as reverential. The soundtrack is comprised of both original works as well as remixed tracks taken from both Persona 3 and 4. The story mode in particular contains even more music pulled directly from the RPGs. The game is also filled to the brim with voice work and features both English and Japanese audio tracks that bring the majority of the actors back to reprise their roles. And while the original English voice over talents for Chie and Teddie didn’t return, their replacements do an outstanding job of taking over. As stated earlier, the story mode is easily the standout feature of Persona 4 Arena, and it’s the primary reason that Persona fans should play this game. It does a remarkable job catching the player up with all of the characters; particularly the Persona 3 cast, now in their early twenties and working for a secret organization. The Persona 4 characters behave exactly as fans might expect, as not much time has passed since they were last seen, with the added twist that the P4 protagonist, given the name Yu Narukami (his name in the anime series adaptation Persona 4: The Animation) is now a fully voiced character. Some characters also see their story paths fork, presenting optional (and hysterical) joke endings. However, the star of the story mode is Labrys, an all-new character previously only referenced in a Persona 3 audio drama. Her story arc is the lynchpin of the narrative and does an amazing job of making her a fully realized character. And as for how the game actually plays, the controls are responsive and easy to learn, and the game gives the player plenty of help in the form both of a thorough tutorial and a challenge mode to practice character-specific moves and combos. Fans of ASW fighters should feel right at home at the controls. For absolute newcomers to the genre, each character has an auto-combo that can be mashed out by simply hammering the basic attack button. It won’t do anyone much good at the higher levels of play, but for new players getting into the game or that simply want to experience the story mode, it’s a major plus. Additionally, all special moves are performed with either quarter-circle or charge motions and avoid more complicated (and less controller-friendly) directional inputs. At its core, Persona 4 Arena is a fighting game through and through, but it’s a very unique fighting game that will appeal most to two distinct audiences. Fans of the Persona series, and fans of the Arc System Works school of fighters. It’s a testament to the efforts of both Atlus and ASW that the game is able to accommodate both. Whether you’re looking for a fun, fast-paced fighting game filled with color or the next chapter in the lives of Persona 4’s cast, you really can’t go wrong with Persona 4 Arena.